In The Bleak Midwinter has been named the best Christmas carol in a poll of some of the world's leading choirmasters and choral experts. 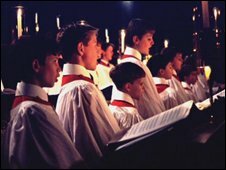 The song came out top in the BBC Music magazine poll above well-known carols Silent Night, Ding Dong Merrily on High and Once in Royal David's City. Pearsall's 1837 arrangement of In Dulci Jubilo and Herbert Howells' A Spotless Rose were voted second and third. The list was voted for by 51 directors of music in the UK and US. Experts were asked to name their five favourite carols and Christmas motets. Gustav Holst wrote a popular version of In the Bleak Midwinter in 1909, but it was Harold Darke's arrangement from 1911 - which begins with a solo voice rather than full choir - that won the poll. While the top 10 includes perennial favourite O Come All Ye Faithful, the remaining carols are largely better known within the choral world. Even popular sing-alongs including While Shepherds Watched, The Holly and the Ivy and The Twelve Days of Christmas failed to make even the top 50. "While some of the carols nominated may seem unfamiliar, does any other song get to the very heart of Christmas as understatedly but effectively as In the Bleak Midwinter?" said Jeremy Pound, deputy editor of BBC Music Magazine. He added that the carol, based on Christina Rosetti's poem of 1872, was "nigh-on perfect as a carol text". "There's the winter cold, the coming of Christ, the description of the nativity scene and, finally, that 'What shall I give him?' moment of self-reflection. And then there's the music," he said. The top 50 carols will be revealed in the December issue of BBC Music Magazine.